I didn’t find any tutorials on how to use a standard PC joysticks/gamepads with the Arduino directly (someone correct me if I’m wrong), so I thought I’d take this opportunity to write one. These input devices can make controlling your projects easy and there are a few controller schemes you can choose from rather than being locked down to a standard game controller (as awesome as the NES controller is, it’s not ideal for all projects) or having to make your own entirely from scratch. Interfacing with these old devices is pretty easy as well since you don't need to decipher any protocol to communicate with them and you can generally figure out what's going on with them with just a simple multimeter. I use an old joystick that I’ve held on to for use with various projects to control the Labywiinth for debug and when we don’t have a PC set up to relay Bluetooth through. I should clarify here that the PC joysticks/gamepads I’m referring to here are the old school PC joysticks have a 15-pin D-sub connector rather than USB. These are readily available in a number of places and are generally very cheap (most thrift stores I’ve been in have them for under $5). If they don’t have tons of features, like more than 4 buttons and 4-axis control, they’ll most likely just be a few potentiometers and buttons wired up in the standard joystick port configuration. 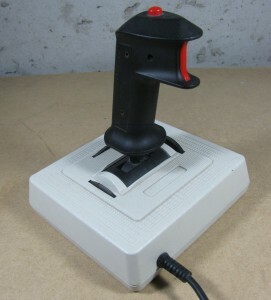 You can find a good write up on the PC joystick port here including a history of the interface (and some info on circuits here). 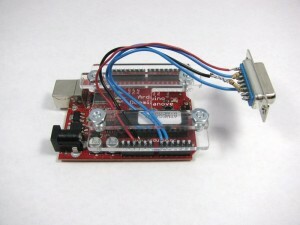 It's also worth noting that if you want to use a more advanced joystick with your project and don’t need a stand alone solution, you can always use a PC to relay input from that joystick to the Arduino as described here, but I really like being able to plug straight into the Arduino in most cases. I used a wiring harness “shield” so I don’t accidentally rip out my jumper wires while using the joystick. If you’re familiar with potentiometers through other experiments with your Arduino (or other microcontrollers) where you hook up a potentiometer and read the voltage on the wiper with the ADC, you may be wondering why we need to use another resistor to measure the potentiometers in the joystick. The answer is, if you look at the schematic of a joystick you’ll notice that only two of the terminals of the potentiometer are wired up. 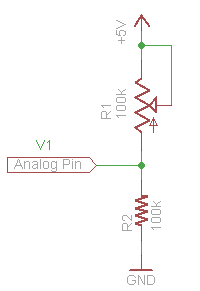 The way you would normally read the position of a potentiometer on the Arduino is to hook up the two outside terminals of the potentiometer to +5V (or whatever voltage you’re operating at) and ground and connect the wiper of the potentiometer to one of the analog channels and read the voltage at the wiper terminal. The reason this works is because the entire potentiometer acts as a voltage divider with current flowing through the two outside terminals. The location of the wiper is basically where the two resistors in the voltage divider are split, and the total resistance of these two resistors is always the value of the potentiometer (just because of the way the potentiometer is constructed). As far as using the buttons on the joystick or game pad go, just treat them as a regular button, but remember that it's wired up to be active low (you'll read a 0 on the pin the button is connected to when it's pressed and a 1 when it's not). 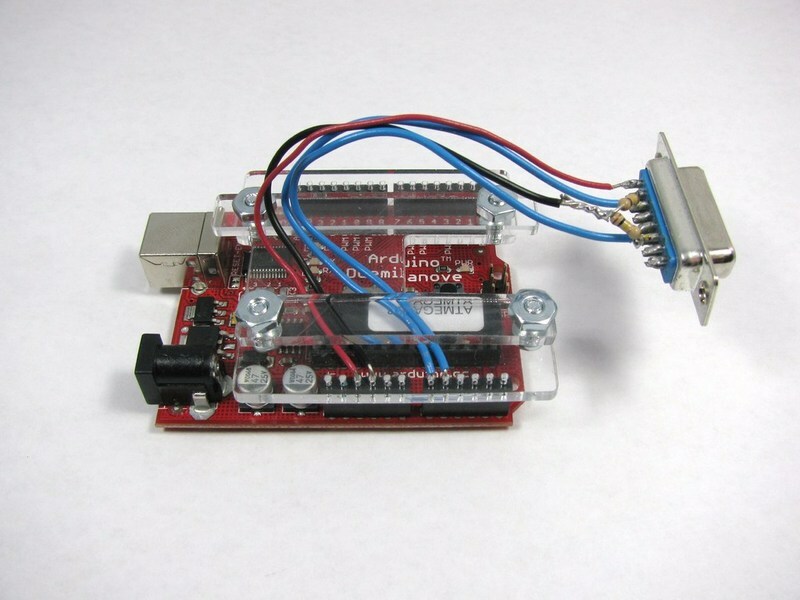 There's a simple example for using a button as an input on the Arduino site. 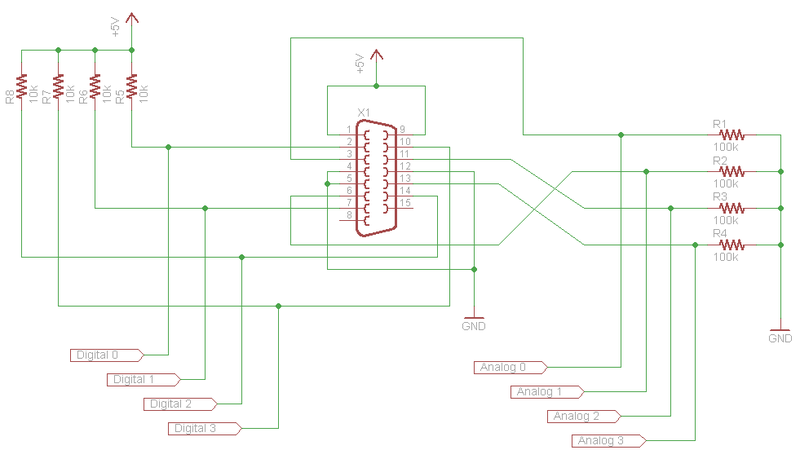 The main reason to hook up the buttons to be active low is because some joysticks and game pads have circuits that are powered off of the ground pins that are used for the buttons and the +5V pins that are used for the potentiometers. Most often this circuitry is used to implement some "turbo" functionality were the controller itself quickly toggles a button when it is pressed and held. I've tested one controller that I happened to have on hand that had a "turbo" mode and it worked properly with the above dongle circuit. So that's it! You should now be able to put some old joysticks or game pads to work in your upcoming Arduino projects. Feel free to post any additional questions you might have and/or corrections I should make to the comments.